The British government has turned down millions of pounds of EU funding to help those affected by flooding and lack of food. Hundreds of thousands across the UK are so poor that they are having to rely on charitable food banks to stave off hunger. The EU parliament agreed to provide aid for those suffering extreme poverty in the EU. The EU offered up to £22 million to help subsidise Britain’s food banks, but the money was blocked by the UK government. Food-bank use in Britain is at record levels, with the Trussell Trust charity running over 400 food banks across the country. More than one million food parcels, each providing enough food for three days, were given out between 2014 and 2015, more than 400,000 of which went to children. Thirteen million people live below the poverty line in the UK. According to the Trussell Trust, 1 in 5 mums in Britain regularly skip meals to feed their children. The Archbishop of Canterbury, the Most Reverend Justin Welby, urged the Prime Minister to reverse the decision to reject EU funds for food banks, but to no avail. British government officials explained that the government rejected the EU funding for food banks because it considers that member states are best placed to take charge of such funding. David Cameron’s official spokesman said the issue is whether the UK should be in charge of the funds that are spent in the UK. Mr Cameron’s government has welcomed food banks, describing them as an “excellent example” of active citizenship. By the same principle, the British government has also not applied for EU funding to help the many thousands in Britain who have lost their homes and businesses because of wide-spread flooding following record-levels of rain fall. EU member states are entitled to apply for money from the EU Solidarity Fund when a natural disaster causes substantial damage, calculated as a percentage of Gross National Income. In the UK’s case, this would be a natural disaster causing damage in excess of 3 billion euros. An application to the emergency fund must be made within 12 weeks of the commencement of the disaster. The governments of Bulgaria, Italy and Romania accessed a total of €66.5 million (£48m) from the fund following recent severe flooding in those countries. According to accountants, KPMG, the cost of the UK floods has so far topped £5 billion, which is roughly €6.8 billion, so Britain is entitled to apply for the EU emergency help. But so far, the UK government has refused to accept any EU support for Britain’s flood victims, just as it has rejected available EU support for those in Britain too poor to buy enough food. Labour MEPs have written to the Prime Minister urging his government to apply immediately for EU funding to help the communities hit by flooding. Last month Labour MP, Jamie Read, asked the Foreign Secretary, Philip Hammond, if his department would apply for EU funding to support communities affected by flooding. But Mr Hammond replied that more time would be required to provide an answer. Catherine Bearder, Liberal Democrat MEP for south-east England, said that EU officials told her that the UK government could apply for £125m in grants for flood victims, 10% of which could be available within six weeks. EU commissioner Corina Creţu said she was surprised that Britain had not yet applied for any EU help for the floods in Britain. Back in the summer of 2007 the then Labour government had no qualms in applying to the European Union Solidarity Fund for support and subsequently received £134 million to help deal with the flood crisis that year which also caused billions of pounds of damage. At the time, the Conservative opposition welcomed the Labour government’s decision to appeal for European funds, but said Britain should have applied earlier. But now that they are in government, it appears that the Conservatives prefer not to apply for EU help at all, even though such support is clearly needed by people suffering right now. Is it because the current government, whose MPs and many of its Cabinet appear to be predominantly Euro-sceptic, is too proud to ask for EU help? 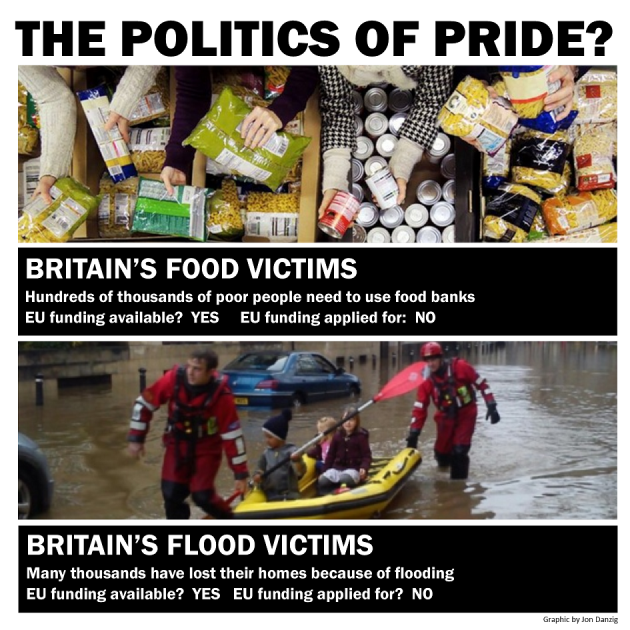 If so, such pride is needlessly hurting many ordinary, every-day people in Britain who tonight are homeless because of severe flooding, and/or don’t have enough money to properly feed themselves or their families. In his Christmas message last month, the Prime Minister said, “giving, sharing and taking care of others” was something Britain could be proud of. And he urged the public to “think about those in need” over the festive period. Isn’t it time for the Prime Minister to practice what he preaches?